Welcome to the Aquarium Feeding Supplements superstore! While normal staple diets for aquarium fish contain the daily nutrients your aquatic pets need to survive, supplementing their regular diets with fortified additives has numerous benefits to their overall health. Extra vitamins and minerals help heighten your fishes' resistance to disease and parasites, enhance their color, and help promote increased levels of healthy and entertaining activity. 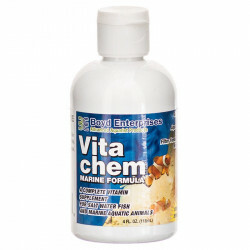 Pet Mountain's Aquarium Feeding Supplements store features top quality products from the most trusted names in aquarium fish care and water treatments, including Seachem, Kent Marine, Boyd Enterprises, Brightwell Aquatics, Acurel, and more. 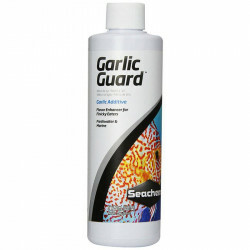 Seachem Garlic Guard is an appetite/flavor enhancer for freshwater and saltwater fish. GarlicGuard will help renew the interest of poor or finicky eaters. GarlicGuard contains the naturally derived, active ingredient found in garlic, allicin, which has been demonstrated to possess health promoting benefits. Allicin possesses strong anti-oxidant properties (similar to Vitamin C) which promote enhanced health through elimination of dangerous free radicals. 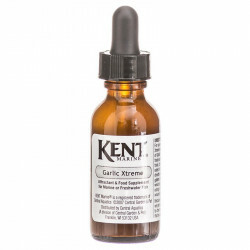 Kent Marine Zoe Marine Vitamin is a superior vitamin complex for Marine Fish, Invertebrates, and desirable algae. Zoe does not contain phosphates as most competing vitamin supplements do, and will not cause unsightly algae growth! Zoe Marine Vitamin contains aquaculture grade vitamins, meaning that they are still active after one year in your aquarium! It is unique because it also contains natural minerals from spirulina and kelp sources. Competing products are preserved with glycerin, which is an alcohol and requires 50% concentration to preserve. 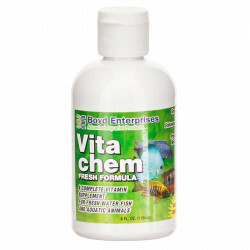 For general fish care, Boyd Enterprises Vita-Chem Freshwater is a complete vitamin supplement with vitamin C and all necessary amino acids and lipids common to overall fish health and regeneration.